Courage is the thing you need most and the hardest thing to get when you’re faced with Alzheimer’s Disease. Jordan, my partner of 17 years has younger-onset Alzheimer’s. His father and several grandparents had memory problems, so the diagnosis was not totally unexpected, but it is still hard to grasp that someone so young and vital is facing such a ravaging illness. Since Jordan’s diagnosis four years ago, we’ve both experienced the stigma that is attached to this disease. At the time of Jordan’s diagnosis we were lucky to live in Seattle where awareness of Alzheimer’s is high. That helped us avoid many problems that I know others experience from the medical establishment. But we’ve each had to handle other issues. Memory problems in older people are expected and tolerated. Memory problems in younger people are often seen as a serious defect. One situation that stands out in my mind happened on a visit to Florida. After his diagnosis Jordan had severe depression and anxiety, and he was taking a powerful combination of medications, which caused him to lose his balance. He decided to walk several blocks to the beach at sunrise one morning and fell. A police officer happened to be in the area and stopped in his car. His response was “Sir, Are you drunk?” Jordan responded “No. I have Alzheimer’s.” The officer repeated that he felt Jordan was drunk and drove away leaving Jordan on the ground. My experience with stigma was at work. Because Alzheimer’s remains a diagnosis of exclusion, it takes a tremendous amount of testing to reach that conclusion. I was taking more and more time from my high-pressure job for doctor visits. Jordan and I were also emotionally reeling from new memory problems that would appear weekly. (At one point, Jordan put socks in the fridge.) I decided to take a leave of absence. When I returned, I found that a shadow replacement had been hired, and I was forced to leave six months later. When faced with discrimination you must have the courage to say “I’m here and just as important as anyone else.” We all have weak moments but fighting the illness sometimes means fighting for yourself or your loved one. There is stigma or discrimination surrounding any serious illness. Just ask someone with Parkinson’s or cancer or multiple sclerosis. But, we’ve also have found that people are generally supportive when they are aware. Many “stigma moments” are really caused by ignorance. People don’t understand Alzheimer’s and many even don’t understand what it means to be chronically ill. 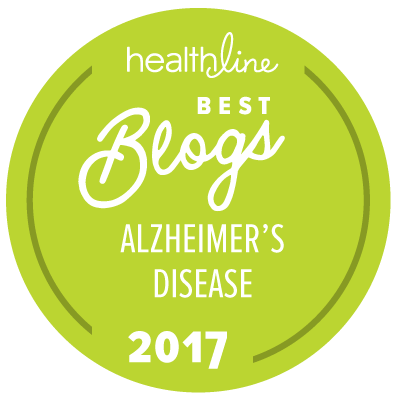 So often, people only think of Alzheimer’s as an end-of-life illness. Even in hospitals nurses will say “but he’s so young to have it.” Courage to change the public perception thru education and awareness is key. And it’s usually accomplished one person at a time through personal contact. Alzheimer’s Disease consumes a tremendous amount of energy and resources. Families are often exhausted by the sheer volume of care responsibilities. And yet this disease is very poorly understood so we also carry the burden of having to educate others. Jordan quickly tells people that he has Alzheimer’s in phone calls and in person so they understand. He also has cards for this purpose. Family is kept updated about his condition and even the little ones are told what to do if there is a problem. But education is also reaching out to the public. I find time to do advocacy for the Alzheimer’s Association. It’s not easy since I don’t have family to help care for him when I’m gone, but it’s essential to raise awareness and unite people in the effort to fight this illness and help the people who have it. If people understand then they won’t be afraid. And if they’re not afraid then there is no stigma – just the disease. About the Blog Author: Rob Epp is a full-time caregiver for his partner Jordan, who was diagnosed with younger-onset Alzheimer’s four years ago. They live in New Hampshire.